I started a tradition several years ago, when I started to travel more frequently. I would email a ‘Pic of the day’ to my family while traveling, along with a brief explanation of the photo and what I was doing. At first, the pictures were from my Treo 600 and the explanations were brief. But over the years, I upgraded my camera as well as my prose (well, I hope). These safari reports are adapted from those emails. After spending a sleepless night in Nairobi after our delayed flight from Amsterdam, we had an early morning flight to Mt Kilimanjaro / Arusha airport. After landing, I was detained in customs. Tanzania has a requirement for a yellow fever vaccine if you’re coming from a specific list of countries. I don’t have the vaccine, but I also wasn’t coming from any of those countries. Except that, I was, because Kenya is on the list, and we had overnighted there because of our previous bad travel karma. It was looking like I was going to have to pay a fine and get vaccinated at the airport, neither of which I wished to do. After explaining our tale of travel woe, and with the help of some vocal Englishmen who were suffering the same fate, the customs agents relented and we were eventually on our way. Anyways, we connected with our driver and, after 6 hours of driving made it to our first stop, a camp deep in the Tarangire National Park. It took 3 hours of driving to get to the entrance of the park, and then another 3 hours within the park to get to our camp. During that time we did some game driving, so it wasn’t just a straight shot through the park. 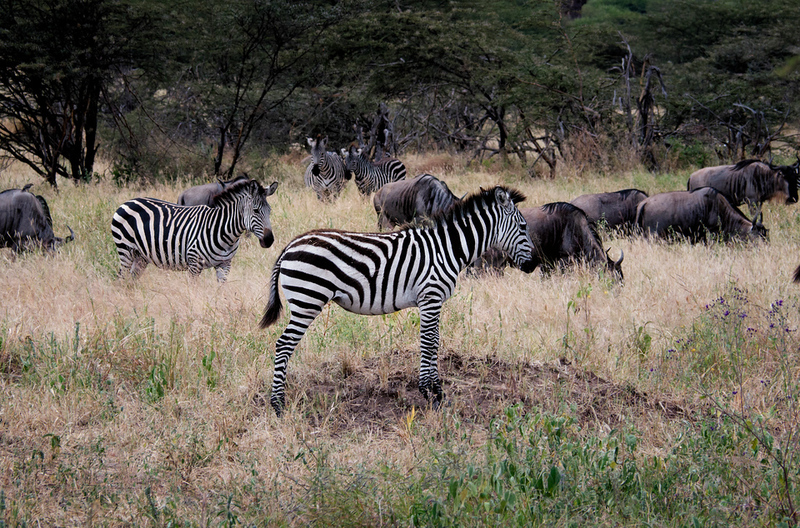 Tarangire is known for its zebra and elephant populations, and we immediately saw some of each. Here’s one guy playing king of the hill. He should have bigger ambitions. 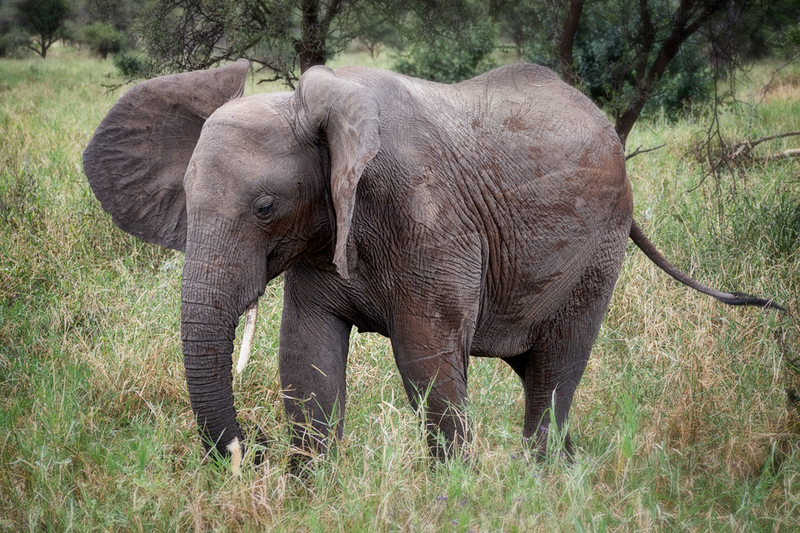 Elephants will coat themselves in mud to keep cool during the warm afternoons. You can see the remnants of a mud bathe on this guy. We also saw a couple warthogs right after entering the park. 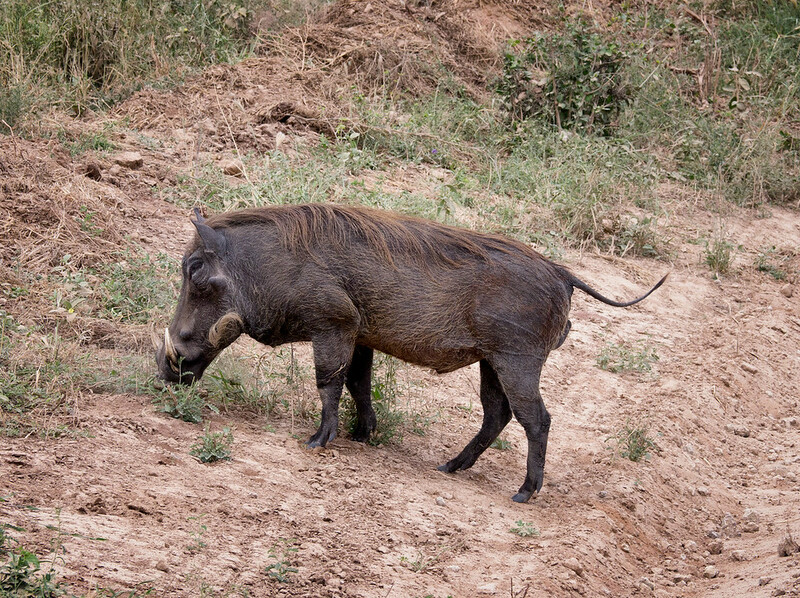 These guys, unlike most of the warthogs we saw in Tanzania, were not very skittish, so we were able to get fairly close. 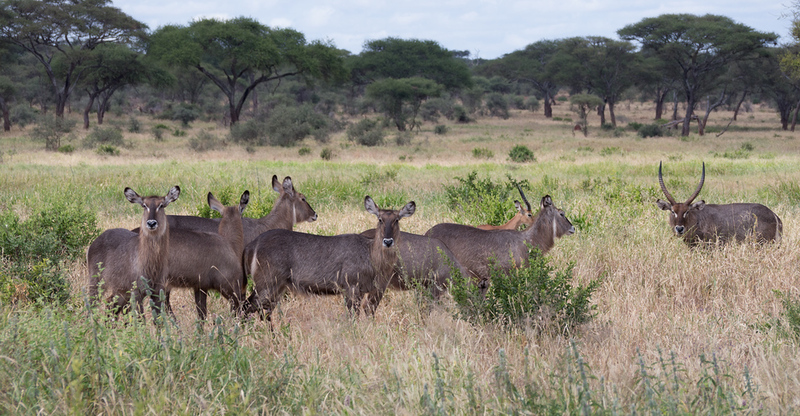 Finally, we saw some Waterbuck, which were voted by Suzanne as the cutest animal in the park.